How the welterweight champion turned an undefeated record into a marketing behemoth. Floyd Mayweather Jr. will be 50-0-0 with one more victory. Floyd Mayweather, the great welterweight boxer, will enter next Saturday’s blockbuster fight against UFC champion Conor McGregor undefeated in his pro career: 49 wins, zero draws, zero losses. Zero, in this case, is a huge number. Mayweather’s perfect record has played a central role in his career and his brand. He’s declared himself “TBE” — The Best Ever — on the basis that he’s undefeated and that everyone else in history with a case for TBE status — Sugar Ray Robinson, Muhammad Ali, Henry Armstrong, Joe Louis, Willie Pep — all have imperfect records. So according to that simplest of metrics, Mayweather triumphs. Only three boxers on the list have ever amassed more wins than Mayweather without suffering a defeat, although two of their records have been tarnished by draws. One modern boxer, Ricardo Lopez, who fought most often in the minimumweight class, retired in 2002 with 51 wins, zero losses and a draw. A century earlier, Jimmy Barry, not shown in the chart above, was a 59-0-10 flyweight who fought his final fight in 1899. But the real potential prize for Mayweather in Las Vegas on Saturday, in addition to the nine-figure payday, is the legacy of Rocky Marciano, also 49-0-0, who knocked out Archie Moore for the heavyweight title in his final fight, at Yankee Stadium in 1955. 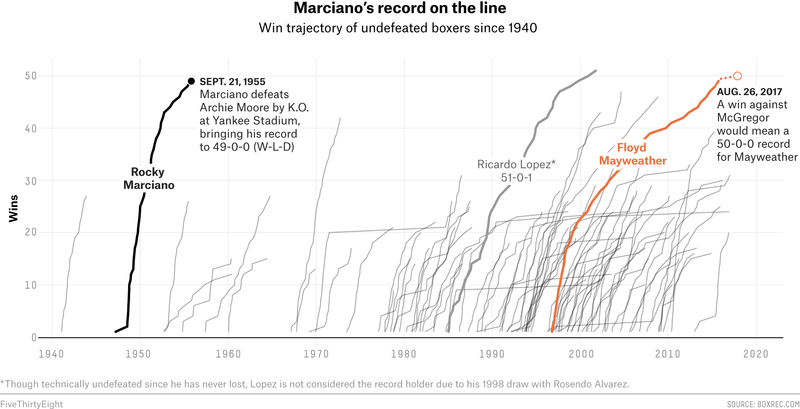 Marciano scraped his way to a perfect record after numerous heart-stopping close calls. The heavyweight, who had a crude style and was of limited stature, also benefited from timing: No boxing expert would give Marciano a chance in hell against a dozen fighters who emerged in his weight class not long after his retirement. Yet his career glistens in boxing history on the basis of his pristine record. Many others stayed in the game too long, and the public witnessed their boxing demise: Ali, George Foreman, Joe Frazier, Larry Holmes, Mike Tyson, Lennox Lewis and, most recently, Wladimir Klitschko. But for Mayweather, the primary function of the zero in his record is not about boxing history, it’s about branding. He’s leveraged this marketing angle into a career as a pay-per-view star and one of the wealthiest boxers in history, regularly appearing on the Forbes list as the highest-paid athlete in the world. Mayweather wasn’t remotely as marketable as he is today until 2007, the year he fought Oscar De La Hoya, the successor to Mike Tyson as boxing’s marquee pay-per-view attraction. They fought 11 years into Mayweather’s professional career, and before that night Mayweather himself was never a main attraction. Why? Few cheered for Mayweather to win, and perhaps no fighter in history ever cared less about being booed for how he won, which was frequently by grinding out decisions and seldom by knockout. Mayweather only became a top draw when he transformed from “Pretty Boy” Floyd to “Money” Mayweather. This transformation into a “heel” — the self-aggrandizing showman we know today — was a shrewd turn. Mayweather fights became more spectacle than substance. Fans were willing to pay to watch a fighting style that was routinely dismissed as boring and utterly defensive. And central to his status as a boxing villain was the record: He was holding up his quest to top Marciano’s perfect 49-0-0 with each fight, luring the public into thinking his carefully selected opponents had a chance to beat him. The more obnoxiously he played up the character of “Money,” the more appealing a sales pitch he made to pay-per-view buyers about the potential pleasures in watching him lose. The loudest cheer Mayweather has ever heard in the ring was not because of anything he accomplished. It was in 2010, in the second round against Shane Mosley, when he was struck by the biggest blow of his career and nearly fell to the canvas. That moment distills how brilliantly Floyd has calibrated his business model. The crowd is reacting to the possibility of witnessing a profoundly narcissistic caricature of the American Dream subjected to humiliation and having his record sullied with a loss. Mayweather recovered from Mosley’s blow to win every round of the remainder of the fight. In another close shave, in a 2011 fight, his opponent Victor Ortiz head-butted him, incurring a penalty. As a defenseless Ortiz gave Mayweather a half-hug, trying to apologize, Mayweather clocked him with a left and then a right, knocking him out in the fourth round. Some suggested that Mayweather should have been disqualified and given a loss; others argued he’d won fair and square. “In the ring, you have to protect yourself at all times,” Mayweather said after the fight. Every boxing analyst on the planet thinks the McGregor fight poses no such threat to Mayweather’s record — but Showtime is selling the fight for $99.95 and the event is expected to make nearly $1 billion all told. Mayweather’s business model is a brilliantly constructed, cynical exploitation of fans’ expectations in the same way modern Hollywood recycles franchises with sizzling trailers that hook audiences — invariably creating a host of unsatisfied consumers. Mayweather’s legacy, unlike Marciano’s and those of other historical greats, has included no career-defining fights that fans discussed with any residual excitement after he retired from the sport (twice). His argument for being “TBE” is a bit like an argument that “The Avengers” is better than “Citizen Kane” because it made more money. In truth, Mayweather was not even his era’s best fighter for the first decade of his career: That was Roy Jones Jr., the cruiserweight voted the fighter of the decade. While both fighters were in their primes, Floyd was never in the discussion about who was the best pound-for-pound boxer. But Jones lost in 2004 and Floyd stepped in. All of which is to say that Mayweather’s claim for being TBE is heavily in debt to his immaculate record — not the substance therein. Lest we forget: Mayweather’s opponent, Conor McGregor, is technically an undefeated boxer, too: zero wins, zero draws, zero losses. In fact, we had to go back to 1899 to find an earlier undefeated career.